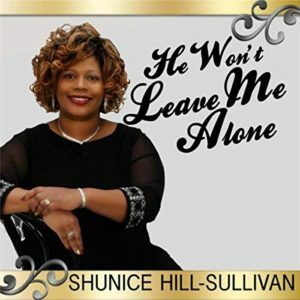 On her EP He Won’t Leave Me Alone, Christian singer Shunice Hill-Sullivan eschews gospel music histrionics for understated lyrics and arrangements. A gentle electric piano guides a small quiet storm combo through the four-cut project, which features prayer closet conversations with God. For example, on “Breakthrough,” Shunice speaks to God from a place of unspecific personal trials. She seeks forgiveness and a return to discipleship, knowing that a breakthrough is possible only after she is back in God’s good graces. “Draw Me Nearer” walks the same territory, though Shunice’s prayers are all-encompassing and more head-shaking, as she implores God to put an end societal ills. The airy title track leads the EP in sequence and quality. 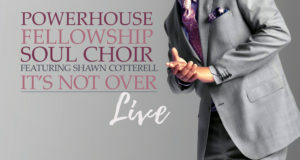 Its neo-soul groove enfolds a testimony of how God is always present. From Chicago, Shunice Hill-Sullivan honed her vocal skills as a member of the Mount Pleasant Missionary Baptist Church Choir, which I believe is where recording preacher Reverend H. R. Jelks once held leadership and his assistant was the Reverend Wealthy L. Mobley. More recently, Theodore Gilmore Jr. was that church’s minister of music. But don’t expect the fiery, extroverted Mount Pleasant Baptist sound here. Shunice Hill-Sullivan is a gentle, matter-of-fact singer. He Won’t Leave Me Alone is about cool contemplation, more suitable for mid-week inspiration than a revival. Love the review on Shunice Hill – Sullivan. I love her songs. I play them on my station Goid News with Lisa. Keep up the God work my beautiful Sister. Love you!